The Blue Religion - Michael Connelly, ed. 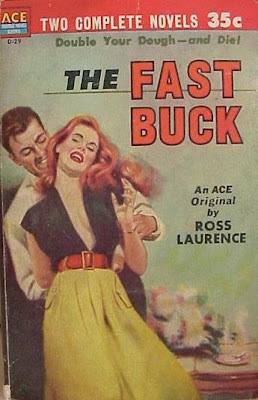 THE FAST BUCK is one of those books that drops you right down in the middle of the action and lets you catch up as you go along. Joe Chicagano, also known as Joe Chicago, is a down-on-his-luck prizefighter who gets involved with the Mob following World War II. He’s not much more successful as a hood than he was as a boxer, and as this novel opens, he’s regaining consciousness on the floorboard of a car being driven by a beautiful woman he calls Legs, because that’s all he can see of her as he comes to. He’s been beaten up and as the mysterious woman shoves him out of the car into the gutter, all he knows for sure is that somebody stole ten thousand dollars from him, and he’s going to get it back no matter what it takes. Then he discovers that the police think he died in a fiery car crash the night before. When he starts trying to figure out what happened to him and find out who took his money, people he talks to have a habit of being murdered in circumstances that make the cops think he’s the killer. Joe’s not the smartest guy in the world and he knows it, but he’s extremely stubborn – and he wants his money back. From here the author really piles on the complications, packing several competing groups of mobsters, stolen gems that were looted during World War II, numerous murders, boxers, and actors into not much more than 40,000 words, if that. The headlong pace of this book is its real strength, along with the occasional good line and some vividly sordid descriptions of various lowlifes and their environment. Don’t mistake this for some sort of lost classic, though. It’s not. The writing, for the most part, is too unpolished and awkward for that. As far as I’ve been able to determine, Ross Laurence wrote only this one book. I wondered at first if the name was a pseudonym for an author better known under some other byline, but I don’t think so. THE FAST BUCK really reads like a first novel, with flashes of real talent struggling to get out through the amateurish writing. If anyone knows more about the author, I’d be really interested to hear it. I wouldn’t rush out to find a copy of this book, but if you run across it, it’s worth reading for the unrealized potential you can see in the author, if for no other reason. You have to give Michael Connelly credit for not writing the same book over and over again. After establishing his Harry Bosch series, he’s made a habit of alternating Bosch novels with stand-alones (although all the stand-alones eventually tie in to some extent with the Bosch novels). Nor is he averse to trying something different within his most successful series. 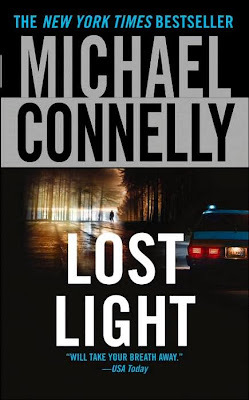 In LOST LIGHT, the ninth Harry Bosch novel, the narration switches from third person to first person, and Bosch is no longer a cop but rather a private detective, having retired from the LAPD. He doesn’t really have a client in this novel. Instead he’s working for himself, trying to solve a case in which he was involved four years earlier, the murder of a young woman that eventually tied in with a daring armed robbery that netted two million dollars being used in the making of a movie. Of course, if you’ve read Connelly’s work before, you know things are going to get even more complicated than that before Bosch untangles everything. The FBI gets involved. There’s a terrorism angle. Bosch wrestles with some personal dilemmas. While all this is going on, Connelly gradually peels back the numerous layers of plot, throwing in some particularly ingenious twists, until he comes to a satisfying conclusion. I think I like third person cop Bosch a little better than first person PI Bosch, but either way the books are top-notch, and LOST LIGHT is no exception. It ends in such a way that I want to read the next book in the series right away, but I’m probably going to hold off for a while so that I won’t get burned out on the series like I did a couple of years ago. My introduction to the Justice League of America was the tenth issue of the comic book of that name, cover-dated March 1962 but published in late ’61. I bought it in the fall of 1962 at the Halloween Carnival held at the elementary school I attended at the time. Kids always donated comic books for the carnival, which were then sold for a nickel each. If I recall correctly, the issue of JLA #10 I bought was coverless, but that didn’t stop me from reading it and thoroughly enjoying the tale of DC’s leading superheroes teaming up to battle the evil sorcerer Felix Faust. I’d read comics featuring Superman and Batman before that, but that issue featured characters new to me, like Green Lantern and Wonder Woman and Aquaman. Skip ahead to a couple of years ago when DC relaunched the Justice League in a new series with ties to the old one. The first seven issues are reprinted in a volume entitled THE TORNADO’S PATH, and not only does Felix Faust make another appearance, but so do numerous other characters, mostly villains, from the early days of the JLA. It’s a very nice blending of old and new, with plenty of nods to the group’s history over the past 45+ years while still being grounded in the current DC continuity. I stopped reading comics for long enough that I wasn’t totally familiar with some of the characters here or the relationships they have with each other, but it wasn’t difficult at all to follow what was going on. The story centers around the Red Tornado, a character that goes back in one incarnation or another all the way to the Golden Age. In this version, which I believe first appeared in the Seventies, he’s an android who wants to become fully human. He gets his wish in this story arc, but of course, things don’t work out quite the way he wanted them to. The script is by Brad Meltzer, better known for his bestselling political thrillers, but it’s easy to tell that he’s a comics fan from ’way back. His script has plenty of action, some humor, and lots of nice touches for the geezers among us who remember those early days. I’ve read one of his novels, THE BOOK OF FATE, and liked it fairly well. It’s no surprise that he spins a pretty complex plot here. Also, the art by Ed Benes is very good. His layouts are a little tough to follow at times (a common complaint for me where modern comics artists are concerned), but I really like the way the characters looked. His versions of the JLA’s core characters – Superman, Batman, Wonder Woman, Green Lantern, and Black Canary – warmed the heart of this old-timer. All in all, I liked this version of the JLA quite a bit. I’d recommend it to anybody who’s a fan of the DC Universe, old or new. I’ve been reading this anthology from the Mystery Writers of America for a while, a story or two here and there between novels, the way I like to read anthologies. Usually in any book like this, there’ll be a story or two (or three) that I don’t like and don’t finish. That’s not the case here. Although some are better than others, all the stories in THE BLUE RELIGION are good. 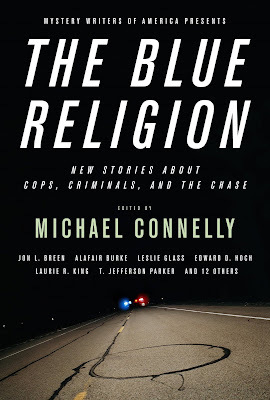 Michael Connelly is a fine choice to edit an anthology of cop stories, and in addition to a short but effective introduction, he contributes a nice Harry Bosch story. Other stories I particularly liked are by relative newcomer John Buentello and old pro Edward D. Hoch, as well as some well-known authors I haven’t read before such as Laurie R. King, Peter Robinson, and Alafair Burke. I’ll have to try some of their novels. Two stories are historical pieces, the moody and atmospheric Western “Burying Mr. Henry” by Polly Nelson and “Oaths, Ohana, and Everything” by Diana Hansen-Young, set in 1898 Hawaii, which manages to get a novel’s worth of plot into novelette length; I thought both of them were very good. But you really can’t go wrong with any of the stories in THE BLUE RELIGION, which is why it comes highly recommended by me. If that doesn’t make you want to keep reading so you can find out what’s going on and why the Comanche Kid is inside that coffin, then you’ve got more self-control than I do. 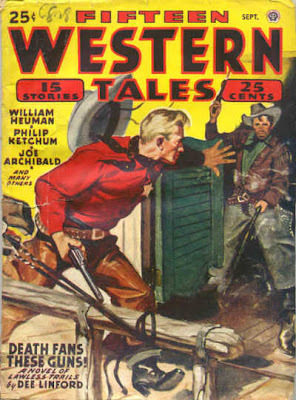 I’ve liked everything I’ve read by William Heuman, mostly pulp stories. I have a couple of his novels on hand that I hope to read soon. Update: I've read the Heuman story now, and it's pretty good, although I'm not sure that it lives up to that opening. Can't say much about it without ruining the plot, but it has a nice hardboiled tone and some good action, both of which I've found to be typical of Heuman's work. Livia has some new pictures up on her blog. My office will be in the little room above the garage. A lot of Western authors have written Fourth of July novels. It’s a situation with a lot of built-in dramatic possibilities: hot weather, small town, lots of people crowded in, etc. I believe Harry Whittington’s well-regarded Gold Medal Western SADDLE THE STORM is a Fourth of July novel. Not sure because it’s been a lot of years since I read it. I even wrote one myself, in the Abilene series. I think it was THE PISTOLEER. It’s been a lot of years since I wrote it. 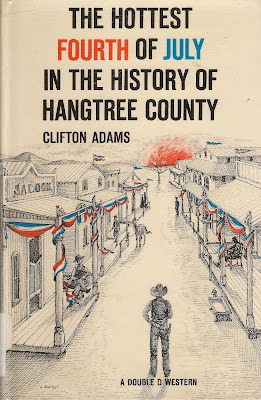 THE HOTTEST FOURTH OF JULY IN THE HISTORY OF HANGTREE COUNTY is Clifton Adams’ entry in this little sub-genre, and it’s a good one. The title itself is an ironic joke, because, as it’s explained in the novel, Hangtree County is only three years old. The book is set in Oklahoma in 1892, three years after the territory was opened for settlement. All the action takes place in one day, which places the novel in another sub-genre I like, books with a compressed time span. Marshal Ott Gillman is getting too old to be a lawman, or at least he thinks he is. His deputy is another old-timer, even though he’s still known as Kid Fulmer, just as he was when he was a young outlaw in Texas before going straight. They make a good pair, both still more capable than they think they are, but this Fourth of July tests their ability to keep law and order because of all the outsiders coming into town for the celebration. Not everyone is in town because of the holiday, though. Some of them show up because of an old grudge against Marshal Gillman, and violence threatens to break out along with the festivities. This isn’t a Grand Hotel sort of book with a lot of interweaving storylines, as Adams keeps the focus on Ott Gillman and the danger facing him, as well as several moral dilemmas the marshal has to grapple with. The pace is deliberate, even slow, for most of the book, but the occasional scenes of violence are sudden and brutal and effective. Anybody who thinks that all Westerns are just shoot-em-ups should read a book like this, which is almost all characterization and mood. Everything leads up to a very suspenseful climax. Charles Bukowski is one of those authors whose work I’ve been aware of for a long time without actually reading any of it until now. I came across a copy of FACTOTUM, an early, autobiographical novel by Bukowski and read it yesterday. Set during and just after World War II, it features Henry Chinaski, a thinly-disguised version of Bukowski himself. Chinaski wanders around the country, gets drunk, works at a variety of menial jobs that he hates, tries to be a writer, and sleeps with a bunch of slutty women. And if you want any more plot than that, you’re out of luck with FACTOTUM. It starts and stops rather arbitrarily and ultimately seems pretty pointless . . . which was probably Bukowski’s point. I tend to enjoy low-life novels. Quite a few Gold Medals and other paperbacks from the Fifties fall into that category. Bukowski does a fine job here of capturing the squalid parts of various cities. There are some good descriptive bits and nice lines of dialogue, and the terse, Hemingway-like prose reads very fast, always a plus where I’m concerned. After a while, though, the plotlessness and the squalor got really old to me, which makes me think that while I didn’t actually dislike the book, I might prefer Bukowski in smaller doses, such as short stories. However, there are two more novels featuring Henry Chinaski, POST OFFICE and WOMEN, and I might read them one of these days, just to complete the trilogy. That prompted me to buy another copy of OLD MAN’S WAR and actually read it this time, and I’m glad I did. It’s one of the best science fiction novels I’ve read in a long time. The protagonist/narrator is seventy-five-year-old John Perry, a new enlistee in the Colonial Defense Force, which only takes recruits when they turn 75. That’s because they transfer the recruits’ consciousness into new bodies grown from their own DNA, and these new bodies are specially modified to make the members of the CDF better suited for fighting the horde of alien races bent on destroying the colonies that have spread out through the galaxy from Earth. Plots similar to this have been used before in SF, but seldom with as much skill as Scalzi displays here. 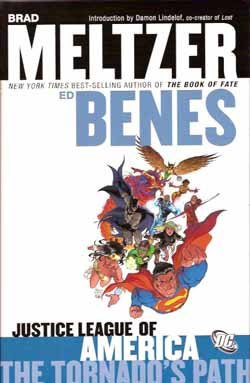 He balances big ideas with gritty, fast-paced action and well-rounded characterization about as well as anybody and better than most. I really liked the way things that he set up early in the book pay off later on, a sure sign of good plotting. The alien enemies are also varied and well-developed, especially the race known as the Consu, who manage to be the typical ravening horde often found in military SF, but with secrets and surprising characterization of their own. 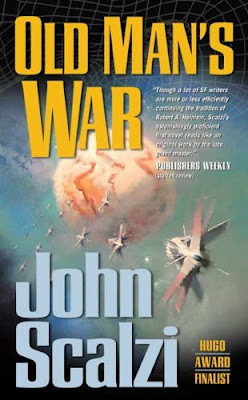 Scalzi has written several sequels to OLD MAN’S WAR. I’ve already picked up the next book in the series, THE GHOST BRIGADES (great title! ), and plan to get the others as well. This one is certainly highly recommended by me and is one of the best novels I’ve read this year. 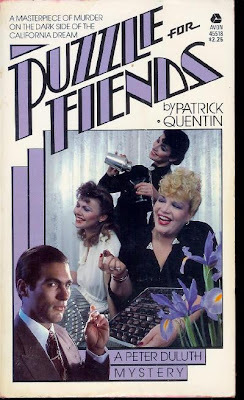 Years ago I read quite a few novels by Patrick Quentin (a pseudonym used by several different combinations of writers, but most often Richard Webb and Hugh Wheeler) featuring producer Peter Duluth and his movie star wife Iris. I remember these as being witty and sophisticated and generally enjoyable, a little along the lines of the Pam and Jerry North books by Richard and Frances Lockridge, but not as good. I never read PUZZLE FOR FIENDS until now, though. It’s a Peter Duluth novel, too – sort of. I say that because for most of the book, Peter has amnesia and doesn’t know who he is. Ah, the old amnesia plot! Well, it wasn’t quite as old in 1946, when this book was first published. After a brief opening in which Peter sends Iris off to Japan for a post-war USO tour, he wakes up in a mansion populated by three beautiful but vaguely sinister women who claim to be his mother, his wife, and his sister, as well as a vaguely sinister doctor who’s there because Peter has been in a car wreck and has a broken arm and leg. Only he’s not Peter anymore (although the reader knows he really is). Everybody claims he’s somebody named Gordon Friend, whose father died recently under mysterious circumstances.